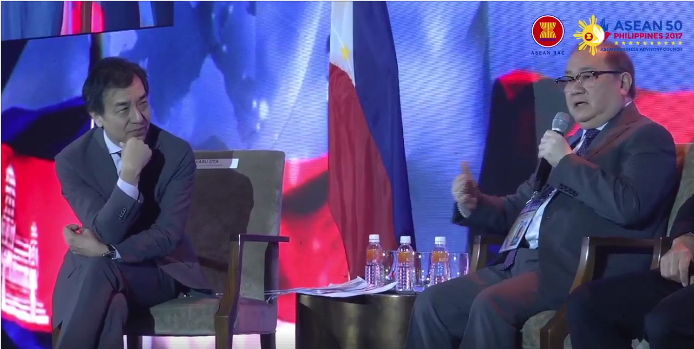 When the moderator of the ASEAN Business and Investment Summit panel discussion on digital entrepreneurship on November 14, 2017 asked Manuel V. Pangilinan to summarize his thoughts on the topic as the most senior member of the panel, the PLDT chairman replied, half-jokingly, that he was also “perhaps the most-criticized”. Filipino business leaders attending the three-day event immediately understood Pangilinan’s quip, though few laughed at his attempt at self-deprecating humor. Like the rest of their countrymen, Filipino businessmen also suffer from one of Asia’s slowest yet most expensive internet service. Even Chinese billionaire and Alibaba founder Jack Ma suffered from slow mobile internet during his short visit to the Philippines late last month. Rightly or wrongly, many Filipinos blame the sluggish pace of internet in the Philippines to the lack of investments on network infrastructure by the country’s two telecommunications companies, PLDT and Globe Telecom. Early in his remarks, Pangilinan addressed the issue head on. He said: “We’re a telco. The internet cannot thrive in any particular environment without the proper infrastructure being laid out, whether fixed line or mobile. And that is what we have been trying to do these past few years.” He challenged the audience to ask him about what PLDT is doing to improve the country’s internet speed during the open forum that was scheduled to follow the panel discussion. “If there’s a Q and A, you can ask me about the challenges of slow internet speeds in this country—both fixed line and mobile,” he said. But later in the discussion, Pangilinan underscored another factor—people’s tradition-bound mindsets—that seems to be slowing digital transformation in Philippine society and economy, apart from inadequate infrastructure. As an example, he cited how payments transactions in the Philippines and in the rest of Southeast Asia are still predominantly in cash. “Part of the challenge of ASEAN as a community and within each country is to inculcate the consciousness and the practice of using digital methods, and part of it is not only the infrastructure but the device, the consciousness and utility of using digital methods of payment and the receipt of funds digitally,” Pangilinan said. He also pointed out how unbanked individuals, or those who do not have access to basic financial services, react when presented with a cashless mode of payment. “If you give them a card [for transactions], the first question [they will ask] is, what do I do with this [piece of] plastic?” said Pangilinan. “I think ASEAN as an internet community will evolve only after certain component members themselves develop that internet practice and consciousness,” said Pangilinan. And he pointed to infrastructure improvement, digital adoption and financial inclusion as the three key factors to this development.